Gareth Evans is closing in on a Pompey first-team return. Yet Ian Foster does not believe the goalscoring midfielder, who injuried both knee and ankle ligaments in last season’s play-off second leg defeat to Plymouth, is ready to appear in a Blues starting XI. Fit-again Evans made his training comeback last Friday, while was an unused substitute in the final pre-season fixture at Bristol City. He then turned out as a 60th-minute substitute in Monday’s behind-closed-doors encounter with Liverpool Foundation, finding the net in the 7-0 victory. The 28-year-old’s re-emergence ahead of the League Two kick off is heartening for the Fratton faithful following a successful maiden campaign. 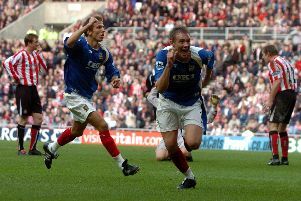 With 10 goals in 47 matches, Evans was a key figure of Paul Cook’s team which reached the play-off semi-finals. Foster regards the former Fleetwood man as one of the fittest members of the Fratton Park squad – an attribute which has quickened his return. But Pompey’s first-team coach has warned a starting spot is still a little away. Foster said: ‘Gareth has been great, he has worked really, really hard during the close season and sacrificed a lot. ‘He’s a fit boy, probably one of the fittest at our football club. ‘You look at his energy levels and the tempo he plays at, the work ethic he puts in – whether it’s on the pitch, on the training ground or in the gym. ‘Anything you ask Gareth to do he does with quality. ‘He has only been back with the group since Friday and travelled with the squad to Bristol City, which was nice. ‘We have now managed to get him 30 minutes on Monday, which has given the lads a lift and, more importantly, gives him a little boost. ‘Gareth is not ready for the first team yet, but wouldn’t be a million miles away because he is that fit and that strong. ‘I don’t think it would take him too much time to get in there but his match minutes are limited and we will try to organise a couple more friendlies if we can for the likes of Gareth and one or two of the boys who might need it. ‘I wouldn’t be overly surprised if he was in the first team very, very quickly, just because we know how fit he is. ‘If we had to use Gareth for 15-20 minutes in a game as a substitute, though, it wouldn’t be an issue. Monday’s friendly also marked Danny Hollands’ return to action, having collected an injury in the same play-off semi-final match as Evans. Yet Evans remains ahead of his team-mate – a factor which saw him granted longer from the bench during the training ground match. And Foster was pleased with the returning midfielder’s contribution. He added: ‘It was a typical Gareth Evans performance, full of energy and he got himself a goal. ‘The ball came square across the box and Gareth does what he does, he penetrates, gets in the final third, gets himself inside the box and scored a tap-in.